The D585 Very Low Pressure Calibrator (VLPC) kit is intended to be used by Navy personnel in shipboard and shore-based laboratories and for on-site, in-place calibration. The equipment will be used to generate, measure, and control pressure within the defined operating range to calibrate pressure-indicating devices including gauges and switches. The VLPC kit is comprised of two separate cases. The initial case houses all of the calibratable components including one pressure indicator, three pressure modules and one calibration module for calibration of the digital indicator. The second case consists of small and large volume controllers as well as hose assemblies and additional adapters. 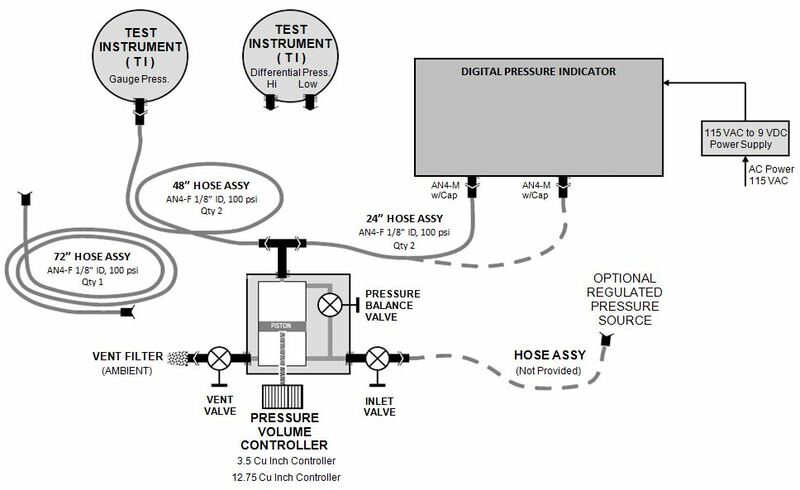 The following diagrams contains all pertinent parts to properly demonstrate the set up and purpose of The D585 Very Low Pressure Calibrator kit. Contact the engineering staff of Measurement Instruments at (724)-459-8090 for more information.